Good news deserves attention too. And we have good news! After a difficult start with the new printing facility in Poland, we are now right on track. We had some startup issues with our new high-tech printing facility in Poland. A number of issues were to be expected when launching a new operation, but we also encountered unforeseen circumstances that required a solution. We have had to disappoint our clients on a number of occasions with regards to quality and delivery time for our printed products. We have offered our apologies many times and resolved the problems to the best of our abilities, as quickly as possible. But good news also deserves attention, in our opinion… and we have very good news! 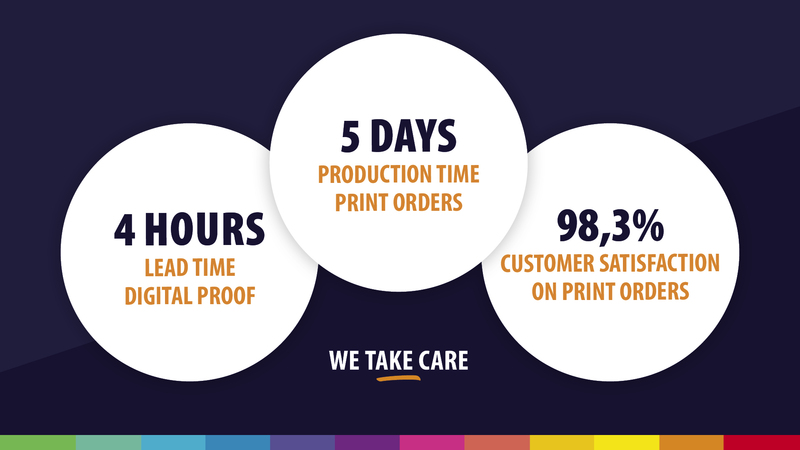 Improving our printing quality and decreasing the number of claims on our printed orders was our top priority in 2018. We have worked hard to implement the necessary improvements and we can now declare that our efforts were successful. With a current customer satisfaction score of 98,3% on printed orders, we easily meet market driven targets. With regards to the lead times for printed orders, we are now able to make the following commitment: as of 25 February 2019, we will print and dispatch within 5 workdays, after we’ve received approval for the digital print proof. This print proof you will receive within 4 workhours (once we have received your order) in your mailbox for production approval for the print order. We take care! If you have any questions, we are happy to help you!